This recording concludes the cycle of Beethoven Piano Concertos. 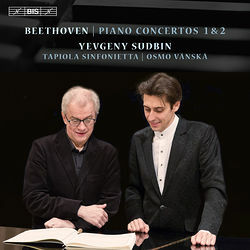 Sudbin and Vänskä have travelled to Helsinki to team up with Tapiola Sinfonietta, one of the top Nordic ensembles, and well suited for these earlier and more classical of Beethoven’s concertos. Of the two, the one we now know as the Second was actually begun several years before Concerto No. 1, and indeed even before Beethoven left Bonn for Vienna. During the following decade, Beethoven returned to the score repeatedly and made substantial revisions – including composing a new final movement – and ultimately the C major concerto reached publication first. Both concertos were conceived long before Beethoven's involvement with the symphonic genre, and the influence of Mozart and Haydn is evident in the interaction between the orchestra and the soloist – but Beethoven's individual spirit is nevertheless unmistakeable.